I HEREBY ASSUME ALL OF THE RISKS OF PARTICIPATING IN ANY/ALL ACTIVITIES ASSOCIATED WITH THIS LIVING.FIT BY KETTLEBELL KINGS/BATTLE ROPES EDUCATION AND HOST FACILITY (HEREBY “LF KBK BR”) EVENT, including by way of example and not limitation, any risks that may arise from negligence or carelessness on the part of the persons or entities being released, from dangerous or defective equipment or property owned, maintained, or controlled by them, or because of their possible liability without fault. I acknowledge that LF KBK BR and their directors, officers, volunteers, representatives, and agents are NOT responsible for the errors, omissions, acts, or failures to act of any party or entity conducting a specific activity on their behalf. I hereby grant Battle Ropes Education, Living.Fit, Kettlebell Kings, and host facility (hereby: “Battle Ropes Education”) the irrevocable right and permission to use photographs and/or video recordings of me on Battle Ropes Education websites, social media accounts and other websites; and in publications, promotional flyers, educational materials, derivative works, or for any other similar purpose without compensation to me. I understand and agree that such photographs and/or video recordings of me may be placed on the Internet. I also understand and agree that I may be identified by name and/or title in printed, Internet or broadcast information that might accompany the photographs and/or video recordings of me. I waive the right to approve the final product. I agree that all such portraits, pictures, photographs, video and audio recordings, and any reproductions thereof, and all plates, negatives, recording tape and digital files are and shall remain the property of Battle Ropes Education. I hereby release, acquit and forever discharge Aaron Davis Guyett, Battle Ropes Education, its current and former trustees, agents, officers and employees of the above-named entities from any and all claims, demands, rights, promises, damages and liabilities arising out of or in connection with the use or distribution of said photographs and/or video recordings, including but not limited to any claims for invasion of privacy, appropriation of likeness or defamation. USE COUPON CODE 2ROPES-COEUR FOR $100 OFF SIGN UP! 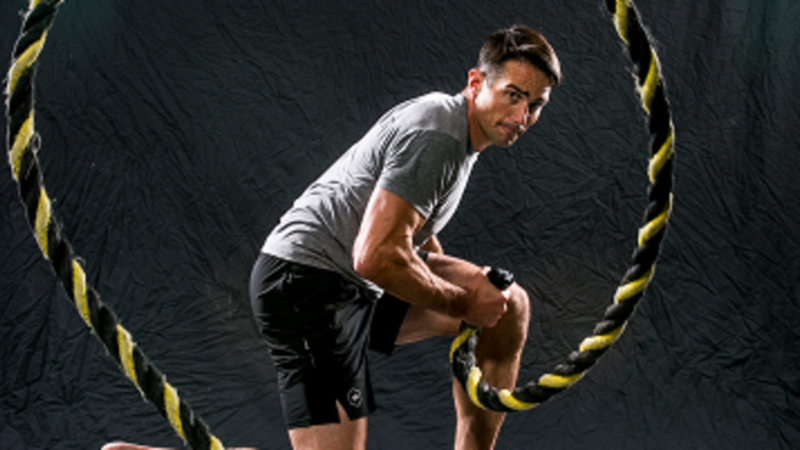 Aaron Guyett is the Battle Rope Master Coach and Fitness Programs Manager for Living.Fit with a decade of battle rope coaching, teaching, and programming. He is able to systematically break down force, so each participant knows exactly how to program movements, metabolic pathways, and mindset to get the most out of your own training and the training of your clients, athletes, and classes.